A new CETIS briefing paper on the IMS LTI specification is now available online. Written by Stephen Vickers (ceLTIc project and an early adopter, developer and user of the specification) the briefing provides an overview of the specification and illustrates benefits of using it for for developers, VLE administrators, teachers and learners. The paper is available for download from here. How would you build a widget authoring tool? Yesterday along with about 20 others I attended a Design Event organised by the Widg@t project, which is being funded through the current round of JISC Learning Teaching Innovation Grants (LTIG). Splitting into small groups, the morning session was designed to get us thinking not about the authoring tool, but rather on designing widgets. Using the paper based design process the team had used during their previous WIDE project (see my previous post on this), each group had to create a design specification for a widget. 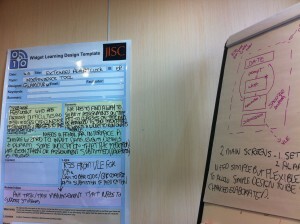 The picture gives an idea of how the group I was in used the Design templates and flip chart to record our ideas. *What would be the best way to replicate the f2f, paper supported, decision making process we had gone through? *What kinds of interface, components and services would need to be available? *How would you save/share/publish outputs? The group I was in spent quite a bit of time discussing the need to include some of the information made explicit in the Design template sheets e.g. detailed “personna” and “scenario” (basically the who, why and how of widget use). Although fully appreciating the need for them, we did wonder if they are better done offline, and if too much pre-authoring form filling might be off putting and actually slightly counter productive? We were also concerned with scope creep and very aware that the team are working to a tight timescale for development. So again we spent quite a bit of time discussing how to create an environment that gave enough options to be useful/useable, extensible to allow new functionality to be easily integrated and also, most importantly, was feasible to build. During the feedback session it was clear that everyone in the room was broadly thinking in a similar way – particularly around the pragmatics of building a working system within the project timescale. The use of templates was also popular, as that provides a way to show users what is possible and also define an initial set of components/services. I found the day to be very stimulating and very well structured, so thanks to all the team for their efforts in planning. As with any well designed design process, our input doesn’t stop after one day. The team are now pulling together all the ideas, reflecting on the themes emerging from the day and are going to produce a draft specification which we will be asked to feedback on before producing their final specification. I’m really looking forward to seeing how the toolkit develops and enjoying being part of a collaborative, user centred design process. Summer generally provides a bit of time for reflection and gathering of thoughts. 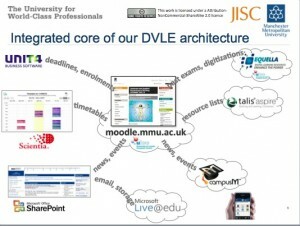 It also marks the start of the final phase of the current JISC Distributed Virtual Learning Environments (DVLE) programme. For the five institutionally based projects, this summer has provided a short break before some major implementations and evaluations get underway in the new semester. This post summarizes some of the developments and future plans as outlined by the projects in their recent interim reports. “•	Enhancing the flexibility of VLEs to meet new and developing user requirements and to permit future expansion and changes. •	Demonstration of a range of architecture models for composing institutionally delivered learning environments. •	Guidance on, and models for, expanding VLE functionality and delivering it in different ways to meet institutional needs. So what progress is being made? tutor; developer; e-learning support; administrator.” More information about the evaluation methodology can be found on the project blog. The DEVELOP (Developing and Enhancing Virtual Learning Environments and E-Learning Options) team at Reading have primarily been exploring the extension of their BlackBoard VLE to allow greater pedagogic flexibility and their portfolio provision so that it can be used for teaching and assessment purposes. Scoping documents for their widget development (Tagging and recommender, portfolio, ASSET Video, content) are available from the project blog. At the moment, the widgets are all at various stages of development and user testing. The user evaluation and testing are part of the rapid prototyping approach the team are using (you can read more about the technical evaluation part of this process in this post. These evaluations will form the basis for a set of case studies around the effectiveness of each of the widgets. The case studies will be based on the templates created at Reading as part of another project JISC funded project, OULDI, which is part of the Curriculum Design Programme. The team have also been working closely with their key internal technical stakeholders to ensure sustainability of developments. The University of Bedfordshire is also testing the video widget. The DOULS (Distributed Open University Learning Systems) team have continued with key user engagement processes to scope, define and specify the set of Google gadgets they are going to develop: Assessment Helper; Forum Recommender; Forums; OU Buddy; Study Planner. Draft gadget functionality specs for each one is available the project blog. The team have also documented their process and have produced a number of useful guidelines relating to usability and accessibility in terms of testing gadgets and overall management of accessibility within a VLE. These are openly available from the blog. The team are continuing to learn the “ins and outs” of working with the Google Apps for Education API for widescale adoption. Again the team are sharing some of their “visions” for potential Google App/Moodle integration and thoughts around potential uses/extensions for the Google start page on the blog. There will be more code releases in September, when they will also start their evaluation. Their interim report is also available for download from the blog. The SLEP (Southampton Learning Environment Prototype) project is part of a wider institutional wide initiative at Southampton to restructure both its research and teaching and learning environments. As you’d expect from Southampton, open and linked data are central to their approach and the team have used a “co-design” process “made up of a large- scale student survey, smaller focus groups and one-on-one interviews) has revealed a preference for a small number of key services in our initial launch (including email and timetabling).” This process has also surfaced the importance of groups and communities, and the team’s prototype interface design highlights these and makes “ them the lens through which students and staff access all of the data and services of the institution”. The project is now coming out of “stealth” mode with their first round of apps being released in September accompanied by a large scale (c. 1,000 students) user evaluation of their new user interface. More detail on their overall approach and the co-design methodology is outlined in this paper presented at the PLE conference earlier this summer. The W2C team continue to make good progress with what they often refer as their “megamash up”. The team have made steady progress developing web services including: PC Availability; Fee Status (RSS); WebCT Areas & Announcements (RSS); Library Reading Lists (RSS) & Podcasts (RSS); Integrating Talis Aspire and Equella. Providing this information in a mobile friendly way has had a dramatic impact on the number of hits these services are now getting. The team have been closely monitoring the usage of these services and shared how they collect the data and some of their insights in this post. The team have also been involved in a study of student use of mobile devices with a number of other institutions. Preliminary findings from the on the MMU part of the study are available in this post . The team have prioritised the development of web services for mobile devices and have been working with oMbiel’s campusM mobile phone product. This has allowed them to rapidly deploy their web-services and create a user feedback loop. The team have also undertaken work in developing open source widgets for their Moodle installation which I’ll refer to later in this post. The W2C project, again is part of a wider institutional change process around provision of teaching and learning and the team have been very pro-active in sharing their “core- plus” model with the rest of the programme and the wider community. The CETIS Distributed Learning Environments briefing paper was a key starting point for the programme, and particularly for the institutional strand, JISC wanted to find out the key institutional infrastructure issues are surrounding more flexible creation distribution of apps/gadgets/widgets and how data can be shared and re-used effectively. •	Widget platforms external to the VLE displaying content from a range of sources including the VLE. •	Plug-ins to the VLE or other institutional web platform demonstrating the use of open educational standards such as IMS LTI (learning tools interoperability). •	The VLE providing some of its data and functionality as widgets/and or plug-ins to be consumed in other environments. •	Enabling access to particular research equipment in VLEs via widgets. •	Identity and access management approaches, such as OAuth. Security has been and continues to be a key concern for projects (as highlighted in this post from Mark Stubbs after the programme start up meeting last September). Accessibility is also a concern, and it’s probably fair to say that the DOULS and others at the OU have had to spend more time than they probably first envisaged ensuring that their Google apps provision met required accessibility guidelines. However there have been some quick wins for example W2C have been able to accelerate their mobile app deployment using an external partner which freed up the team’s time to work on developing web-services. We are also beginning to get a far greater understanding of student mobile device ownership and indeed from all the user engagement across the projects a greater understanding of the key data/services which staff and students actually want and use regularly. In terms of standards/ specifications we have a stalwart supporter of the IMS LTI approach from Stephen Vickers at the ceLTIC project who clearly thinks the IMS way is a win, win, win scenario. There is still some resistance to implementing LTI in other projects – partly due to their unfinished status. Reading are keeping a watching brief on developments and are concentrating on developing widgets they know will work in their VLE. Whereas Southampton prefer to work with more conventional, non education specific web service approaches. However the recent announcement from IMS that they are now merging the development of full and basic LTI into one specification may start to convince more potential adopters. Once again the security question raises its head. Whilst there seems to be more convergence across the IMS, Open Social and Wookie development communities around the use of services such as OAuth, and the development of data handling process which sh/could start to allay common concerns around security of sensitive data such as assessment information etc. However, there is still probably a need for quite a dramatic culture shift within institutional provision and access before OAuth is widely adopted across the sector. The programme has also afforded the opportunity for projects to explore the W3C Apache Wookie (Incubating) approach to the building and deployment of widgets. Our widget bash provided hand on opportunities for developers to get started building (and repurposing their own apps) wookie widgets. Despite the (relative) ease of building widgets, there has been some articulation surrounding concerns around the institutional deployment of a wookie widget server see this post from the W2C project. There continues to be an appetite for a stable sandbox/test server that projects could experiment with. This has been discussed before through our widget working group (pre-cursor to the DVLE programme) and it is something we at CETIS do recognise. Unfortunately we aren’t in a position to guarantee stability of any such service, and so we have being advocating a community based solution (perhaps augmented with a bit of funding from JISC). This is bound to be something we return to at the end of the programme once the projects have completed their reviews of their approaches and we can get a more informed view from across the programme. There is also the question of where widgets/apps/gadgets should be accessed from after the projects finish. Should the code be available only via project websites? Do we need think about developing education app store (again this brings up similar issues as the wookie test server). One potential interim measure we are starting to investigate is the use of the JISC Design Studio which is primarily being used to share outputs from the Curriculum Design and Delivery programmes, but there are plans to use it to share other programme outputs too. In the final stage of the funding cycle, the projects will be reflecting more on their infrastructure and how they relate to the models outlined in the CETIS DLE briefing paper. Both DEVELOP and W2C are seeing alignment with Model 2 “plug-ins to existing VLEs”. W2C have begun to articulate their model in a some more detail in this post. Over the coming months as evaluations begin in earnest, it will be interesting to see any convergences of approaches/models start to appear, and to explore what kind of affordances the projects distributed learning environments have to offer over traditional approaches. More information about the projects and the programme support activities can be found on the CETIS wiki. There is also a public netvibes page with feeds from all the project blogs. The timeline below also gives another view of programme activity through aggregated tweets using the programme hashtag #jiscdvle and with an RSS feed from the related Learning Platforms topic page on the CETIS website. JISC DVLE Programme on Dipity. “Win, win, win” Are we really there with IMS LTI and LIS? “Win, win, win” is the mantra from Stephen Vickers (ceLTIc Project, University of Edinburgh) is going to be taking to the Blackboard conference next week. During yesterday’s webinar “IMS LTI and LIS in Action”, Stephen gave an overview of the integrations the ceLTIc project have been able to achieve using basic LTI. And it does seem that we might actually be at a turning point for both basic (and hopefully full LTI) with most of the major VLE vendors now implementing it, and projects such as ceLTIc and EILE (University of Kent), who also presented their work using LTI with Moodle, being able to show real examples of a number of service integrations including blogs, reading lists and streaming servers. However the biggest battle for uptake and adoption is probably the hardest one – the move from general awareness raising to actually widespread and commonplace use. And, as Stephen pointed out this isn’t just an question of making developers more aware of, but teachers too. So they are the ones asking the question of their VLE teams “do you support LTI” with the knowledge that they can integrate or “mix and match” a lot more “web stuff” into their VLE if the answer is yes. The IT departments should also have the confidence that taking this approach will mean that they can bring more services into their VLE, offer more flexibility to academic staff and not have to worry about a major system upgrade every time they want to add another service. However these things can take time, and even in the JISC DVLE programme it’s only the ceLTIc project who are actually using LTI. The other projects have noted interest, but as is so often the case, it’s just not quite a priority at the moment, possibly because a number of the projects are dealing with more administrative and non VLE services. Also as the CETIS DLE briefing paper outlined there are a number of potential models for learning environment integration – LTI isn’t the only game in town. On the plus side with more major players now actively involved we might just be on the cusp of seeing some significant advances over the coming year. The session also included an update from Linda Feng (Oracle) on recent developments with the IMS LIS specification. Again it was encouraging to hear that the working group have been trying to make the spec as usable and flexible as possible. Linda explained how the IMS working group have been developing a set of profiles to allow greater flexibility for implementers and more importantly the profiles will be available, tested and ready before the spec is finalised. Taking this more iterative approach has already allowed the working group to already sort out some element naming gotchas. Linda also gave a quick walkthrough of a demo of some work Oracle and Blackboard having been doing with SIS data and will be presenting at next week’s BB Conference (an annotated version of the demo is available online). Phil Nicolls (Psydev) then demo’d some bulk data imports from the a cloud service into Moodle. So all in all a very interesting session with lots of real examples of standards being used in real situations. The recording is available for viewing by following this link. I really like widgets or apps or whatever you want to call those little discrete things you can pop into a web-page, VLE, blog, access on your phone etc. Over the last few years at CETIS we’ve been supporting developments in this area through various activities such as the widget working group, the current JISC DVLE programme and our widget bash earlier this year. As I’m not a programmer I’m also always on the look out for easy (and preferably free) ways to make widgets. A couple of years ago I thought I had found the answer with Sproutbuilder, but hey-ho as is the way of things they changed their terms of service. As I really didn’t do that much with it, it didn’t seem worthwhile to pay for the service. So, over the past couple of years I’ve been really keen to see some kind of WYSIWYG widget builder funded. We didn’t quite get there within the scope of the DVLE programme, however I’m delighted to report that the latest round of JISC LTIG grants includes the Widg@t project from the University of Teesside. I’m a really looking forward to seeing the developments and final output from this project and hopefully having fun building some widgets again. This time with an open source, W3C standards compliant tool:-) As I’ve commented before, it’s also great to see a continuum of development from across JISC funding and to see pedagogic and technical developments truly working hand in hand. The team are also looking for community involvement, so if you want to get involved please do contact them, details are on the project website.